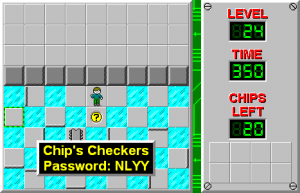 Chip's Checkers - The Chip's Challenge Wiki - The Chip's Challenge Database that anyone can edit! There are 25 chips here, but you only need 20. Chip's Checkers is the 24th level in Chip's Challenge Level Pack 1. It was created by Andrew Menzies. The bold route may only be 7 seconds long, but it's 7 seconds of nonstop boosting with only 2 steps-one of which is off the starting tile. 343 route: Step L and slide >DULD 2L 2D LU 2D URL to bounce off the toggle wall with 16 chips remaining. 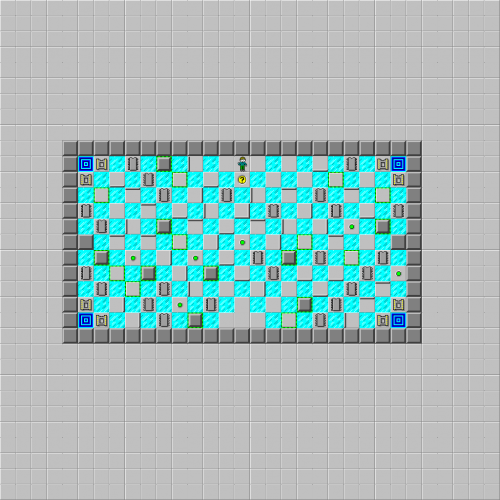 Continue sliding >R 3U LR 5D RU 2R U 2R 2U R 2D RLD 2L DR 3L to the bottom center floor tile with 7 chips remaining before stepping U and sliding >3L 4R U 3R 3L 3U 2R D 2R 2U onto the exit. This page was last edited on 26 February 2019, at 03:33.